Amanda R. Browning lives in southern Indiana with her husband and three children. She has been an avid fan of all things paranormal her entire life. After being a dedicated reader since childhood, she started writing when she ran out of books to read and her brother challenged her with, "So write something." Emily Goodwin resides in Indiana, where she lives with her husband, many four legged children and their much loved German Shepherd named Vader. Accused of being a day dreamer, Emily began writing at an early age, making use of her active imagination. She has degrees in psychology and nursing, likes anything paranormal, 80's rock, and is an animal rights activist. I wasn’t afraid of death. If I died, it would be over. My worst fear wasn’t of dying, it was of living. Living, while everyone around me had their flesh savagely torn from their bodies to be shoved into the festering and ever-hungry mouths of zombies. It terrified me, right down to my very core, to be alive while the rest of the world was dead." In the midst of the Second Great Depression, twenty-five year old Orissa Penwell doesn't think things can get any worse. She couldn't be more wrong. 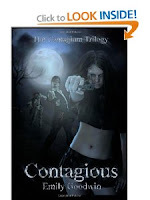 A virus breaks out across the country, leaving the infected crazed, aggressive and very hungry. Orissa will do anything-no matter if it's right or wrong- to save the ones she loves. But when she discovers that most of the world is infected or dead, she must decided if those lives are worth saving at all. After the discovery of a zombie-proof safe house, things are finally looking up for Orissa Penwell. But her chance at happiness is shattered when someone she cares about is shot. Hell bent on revenge, Orissa will do whatever it takes to seek vengeance and get even. 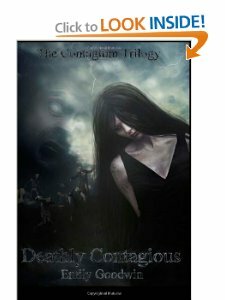 Things quickly go from bad to worse and she finds herself lost and abandoned—and forced to face the zombie plagued world on her own. When lies, secrets, and desperation are added to the already harrowing world, Orissa discovers that zombies aren't the only things to worry about. What—or who—will justice cost her? And just how far will Orissa go to avenge someone she loves? I support Amanda R.Browning all the way. If I could choose 2 the other is Carmilla Voiez. Hi Jessica, thank you for stopping by, there is two double the horror for the week of the 9th-13th, the HFA voting and the Spotlight events 6 pm eastern time, or check link above, and chat with your favorite authors, and enjoy the horror so much more.